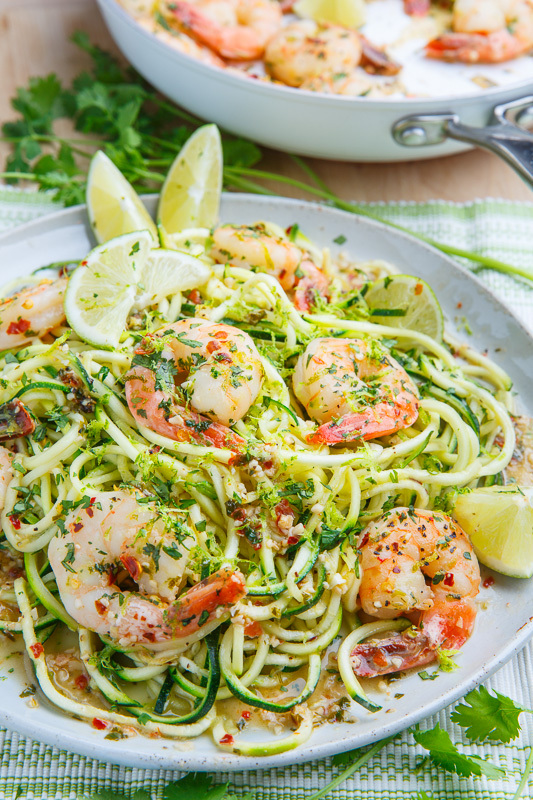 Shrimp in a tasty butter, garlic and lime sauce with plenty of fresh cilantro/coriander served on zucchini noodles! 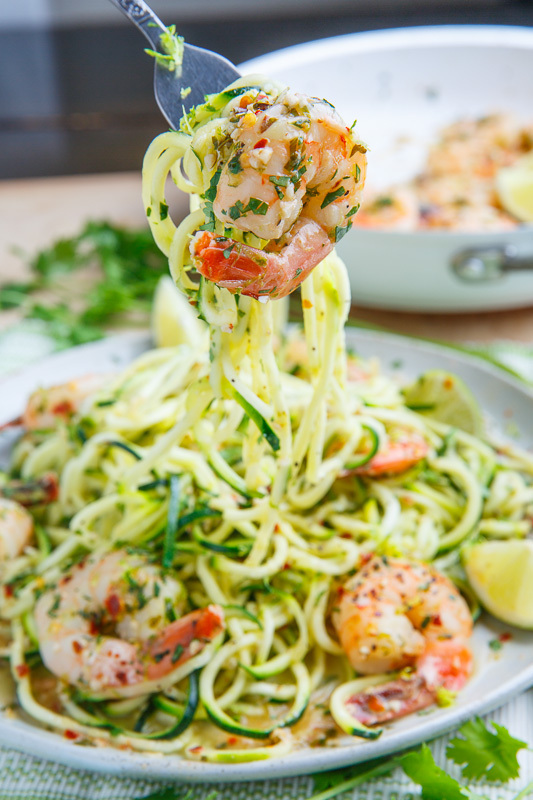 Shrimp scampi, which is basically shrimp cooked in a butter, garlic and lemon sauce, is one of my favourite meals! 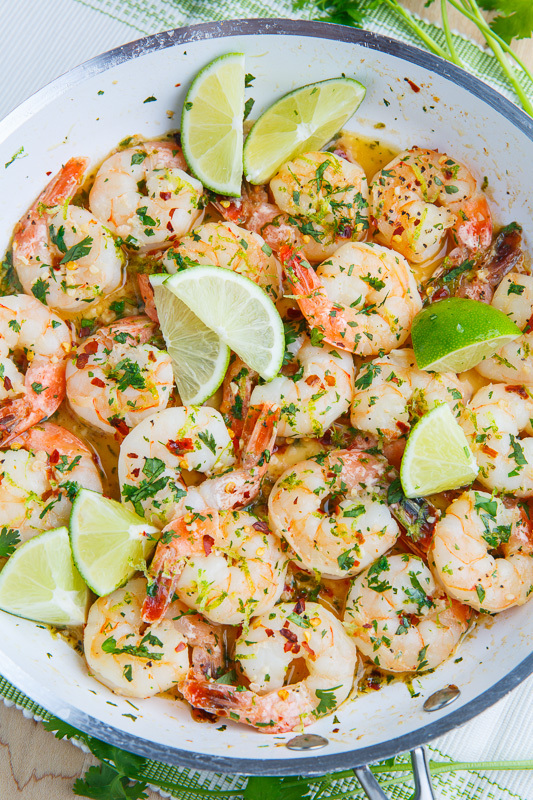 The other day I was enjoying some cilantro lime grilled shrimp and I could not help but think that the fabulous cilantro and lime flavour combo would be great in shrimp scampi! I mean if you take something that is already good, like butter and garlic, and combine it with something else that is great, like cilantro and lime, you can only get something even better! I was right! The buttery, garlicky, cilantro and lime sauce is absolutely amazing with shrimp; and it’s so quick and easy to make! 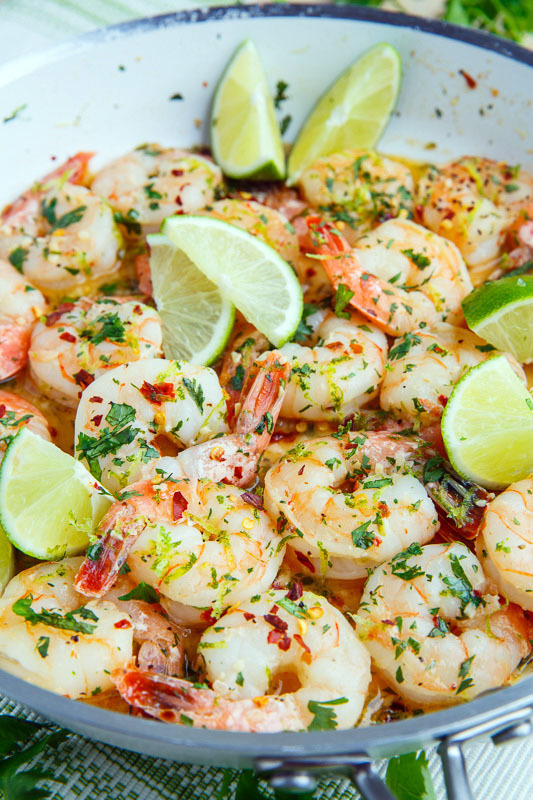 You can serve this cilantro lime shrimp scampi all by itself, with crusty bread, on rice, on pasta, on quinoa, etc. 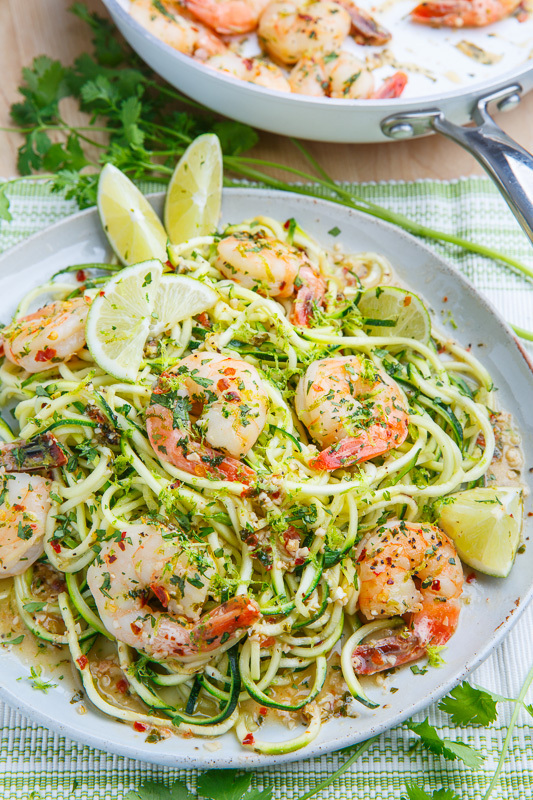 or my current obsession, zucchini noodles to make for a complete, light summer meal! Melt the butter in a pan over medium-high heat until frothing, add the shrimp, cook for 2 minutes, flip, add the garlic and red pepper flakes and cook for 1 more minute before setting the shrimp aside. 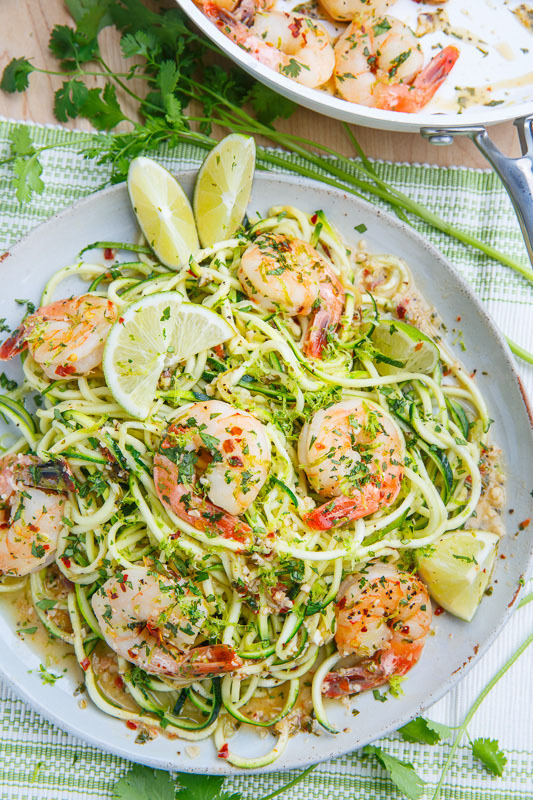 Add the white wine and lime juice to the pan, deglaze it, simmer for 2 minutes, add the zucchini noodles and cook until just tender, about 2 minutes, before seasoning with salt and pepper, adding the shrimp, lime zest and cilantro, tossing everything and removing from the heat. Note: Cut the zucchini into noodles with a mandoline or a spiralizer. Kevin, you post the BEST recipes! I'll be making this one soon! Thanks for all you do! This looks wonderful! I love the cilantro and lime! That shrimp looks too good. Love the idea of this dish, decadent but yet so good for you. Oh man, this shrimp looks wonderful!! I have to agree with James, to me it tastes like soap. I read that is a genetic trait, and my sibs also do not like its taste. I will also substitute parsley, or maybe basil. In your instructions it says "Heat the oil and melt the butter…." What oil? Your recipe only mentions butter. You say to add oil with the butter, but no oil is listed in the ingredient list. So…EVOO? And how much? 1 or 2 Tbsp? How does one "cut zucchini into noodles"? The flavor in this dish was absolutely amazing! Big, big hit for dinner. I was dying for a little piece of french bread to soak up the leftover sauce in the bottom. I do have to disagree with the serving size.. I doubled the zoodles (I used 8 small-medium zucchini) and made a bit more sauce and two of us demolished this dish (we did have a few shrimp leftover). I can't imagine this serving four! Kevin I have been on your site for a long time & to the hater or "Cilantro", well I used to hate it myself & now I love it..& it is definitely not a reason to stay away from your site. I hate goat cheese, but I would not stay away from something just because I did not like a certain element in the recipe. But that comes from maybe not being up on more refined recipes. I think you post the most amazing recipes I have seen. Just keep doing what you do…absolutely wonderful!!! This is What's For Dinner tonight! I think I'll throw in some baby tomatoes, too! As for cilantro, it used to taste like soap to me, too. Apparently, it's a genetic trait. For some strange reason that changed and now I love it! Cilantro is definitely an acquired taste you either like it or you don't there is no middle ground, but this recipe looks amazing. What is the serving size on your nutritional info? I tried this tonight and it was so amazing! Thank you Kevin. I can’t wait to try this one. I love your recipes, and find them very easy to incorporate into my WW points. Keep up the great work. Nice light recipe. Had to spin the zoodles to remove most of the moisture. End result was fantastic. Zoodles were aldente and left enough moisture behind with flavors from wine, pepper flakes and garlic. Will make again. Thank you for this recipe.